Between 1965 and 1980, Amicus Productions made nine horror anthology films, of which Roy Ward Baker directed three: Asylum, The Vault of Horror, and The Monster Club. 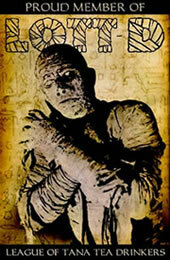 Of Baker's treasuries of terror, Asylum is probably the best. With help from a solid screenplay by author Robert Bloch ("Psycho," the novel) and a top-notch cast (including Herbert Lom and Peter Cushing), Baker works a good mix of thrills, chills, and fun into the 88-minute runtime. A man (Richard Todd) kills his wife (Sylvia Sims) with an axe, wraps the separated limbs and torso in brown paper and tosses the lot in the freezer. However, a mystical charm revives the individual parts, and they revenge themselves on the man and his lover (Barbara Parkins). This is the most chilling of the four segments. The paper-wrapped limbs are extremely creepy as they crawl and scuttle across the floor toward their intended victim. While characterization is slim (a complaint one can level at most of the segments), here it's not strictly necessary. "Frozen Fear" has a formula that has been in practice since the early days of Gothic literature: unlikable people do bad things and receive a deliciously just punishment for their sins. As long as the crime is sufficiently heinous and the retribution macabrely appropriate to the crime, this type of story is going to work. "Frozen Fear" is perfectly balanced in this respect. Baker adds to the story's effectiveness by overemphasizing the limbs just slightly as they move, acknowledging that there is an element of the ridiculous to them while resisting the temptation to go "camp." A down-on-his-luck tailor, Bruno (Barry Morse), accepts a job to make a suit for a strange gentleman, Mr. Smith (Peter Cushing). Bruno is to only work on the suit after midnight, following a specific pattern, and using an unusual, glowing material. When Bruno delivers the finished product, Mr. Smith tries to take the suit without paying and the tailor accidentally kills him in the struggle. Bruno discovers too late that the suit has occult powers. Where "Frozen Fear" worked primarily because of a combination of the story and Baker's direction, "The Weird Tailor" is an acting showcase for Morse and Cushing. They carry the characterization where Bloch's script does not, providing nuance and pathos where none would otherwise exist. Note Cushing's performance especially -- when we first meet Mr. Smith, he is cold, diffident. Later, when Bruno delivers the suit, his demeanor has changed subtly and we see that the previous coldness was borne of a determination that has now given way to desperation. This becomes even more apparent when we learn why he had the suit commissioned. Even with such a small role, Cushing is a revelation. Morse is just as good as the tailor who finds himself doing questionable things to keep his business alive. Morse's performance reveals a man who clearly values hard work and is bewildered as to why that's not enough to succeed anymore. Baker assists Cushing and Morse largely by staying out of their way and focusing on maintaining a good pace. The director's only misstep here is in the last minutes, when the power of the specially tailored suit is revealed. No care is taken to really make this part as scary as it should be -- it feels rushed and poorly composed, like Baker couldn't wait to move on to the next segment in the anthology. It's unfortunate, too, because the botched ending mars an otherwise engaging story. Barbara (Charlotte Rampling) has just returned from a psychiatric institution, only to find that her brother has made her home a prison. Barbara's friend Lucy (Britt Ekland) plots to help her escape, but Lucy isn't everything she seems to be. This is the weakest of the four segments, mostly because Bloch seems to think he's being terribly clever when he's not. "Lucy Comes to Stay" is adapted from a short story that Bloch wrote seven years before he wrote the novel "Psycho," and the two share a similar twist. I don't mind spoiling it since it's fairly obvious early on -- Lucy is an alternate personality of Barbara's that she sees as an external entity. This type of story, where the main character is discovered to be one and the same as the friend/sibling/child that they blame for all the horrible things that occur, shows up frequently in horror anthology films and I haven't see a single one work in the short form. One reason is that the writer has to spend most of the segment's short running time establishing the clues about the alter ego, so he's forced to hang most of the story's dramatic significance on the reveal at the end. I suppose that works when the ending is a surprise, but it never is; certain aspects of the story are always left just a little too vague (so that the logic of the twist isn't violated), and it's always a dead giveaway for what's to come. "Lucy Comes to Stay" is a classic example of these blunders, which are compounded by the fact that Baker's direction works around the gaps in the plot, calling attention to them rather than distracting us from them. Back at Dunsmoor, Dr. Byron (Herbert Lom) shows Dr. Martin his collection of mannikins -- dolls meant to house the wills of men. One of these mannikins looks exactly like Byron, and the good doctor plans to use it to end the tyranny of Dr. Rutherford. While this segment is short and a little rushed, I can overlook its flaws because I find animate dolls to be extremely unnerving. The concept of something that looks human-but-not-quite and moves when by all rights it shouldn't just gives me the willies. Baker uses low, menacing angles throughout "Mannikins of Horror" to build on this discomfort -- it's eerie to watch the miniature Lom make its way down the asylum halls and even eerier when it does intelligent things like hide from the orderly or climb into the dumbwaiter. On top of that, the acting in this segment is quite good. Lom is the real standout; when we meet Dr. Byron, he's the very model of an urbane medical professional. Lom soon strips away this veneer, however, to reveal the blithering madman underneath. Patrick Magee, too, gives an engaging performance. As Rutherford expounds on the futility of reaching out to the patients, the casual heartlessness Magee gives the character makes us wonder if Rutherford is really any better than the crazies he keeps upstairs. 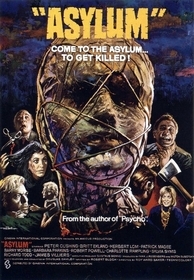 Something else that's quite pleasing about "Mannikins of Horror" is how it ties in with asylum wraparound organically. Indeed, the segment's end (with Dr. Martin crushing the mannikin underfoot) runs breathlessly into the conclusion of the film itself, where we finally discover Dr. Starr's identity in a neat moment that is probably the best twist in the whole film. I give Bloch full marks for treating the wraparound as necessarily related to the stories told within it, rather than as an arbitrary connective tissue that could easily be replaced or ignored (like in 1972's Tales from the Crypt, written by Milton Subotsky). Three of Asylum’s four stories come highly recommended – a good average – but this omnibus has the added advantage that its wraparound is kept smartly relevant to segments it connects. With its eclectic mix of frightful tales, good direction, and superior acting, this is one Asylum you’ll want to get locked up in. Submitted by Taylor (not verified) on Mon, 2010-09-13 19:49. Great review. I watched this tonight and it's an excellent film. Submitted by amicus movie fan (not verified) on Sat, 2011-01-08 12:24.
this is a great film. i have watched it several times over the years. i really love all the old amicus films and the hammer films also. i have a question about this film. the artwork the old prints on the wall at the first of the movie. were these made for the movie or are they old art prints they jest found to use for the movie. who is the artist and how many of the prints are they. how old are they. they gave the film a great feel. Submitted by Anonymous (not verified) on Fri, 2011-12-02 21:18. I read in an article decades ago who did the artwork of early asylum horror. I can't remember if they were done for the movie or were found. I'm betting they were done for the movie. Simple drawings and pencilings, yet with brilliant results. This, to me, was always the most horrifying and disturbing part of this movie.